In a week when retail sales rose, banks began paying off their government loans, and a compromise appeared to be struck in the Senate over the controversial public option, the economy and health care competed for the top of the news agenda. At the same, as international talks were about to begin in Copenhagen and doubters of climate change pounded on what some call “Climate-gate,” the subject of global warming received its most attention in the media since PEJ began monitoring the news in 2007. 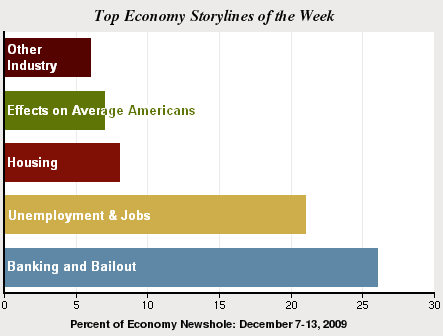 For the week of Dec. 7 to 13, the economy filled 16% of the space studied of print and online news, and airtime on radio, cable and TV, according the Pew Research Center’s Project for Excellence in Journalism. In its weekly News Coverage Index, PEJ found that health care followed close behind, filling 14% of “newshole” studied. Global warming was the No. 3 story of the week, filling 10% of the NCI newshole. And just a week after the President’s speech to the nation about his plans there, Afghanistan fell to 5%, down dramatically from 27% a week earlier. President Obama’s acceptance of the Nobel Prize for Peace came next, the No. 5 story at 4% of the newshole. And the saga of Tiger Woods receded somewhat, just as Woods himself announced at week’s end that he was suspending his golfing career indefinitely and some of his corporate sponsors began abandoning the sports and marketing star as sordid details emerged of a lifestyle of marital infidelity. Coverage of the Woods story filled 3% of newshole studied, about half what it was a week earlier, though watchers of tabloid programs like Acc ess Hollywood would have gotten a much bigger dose. Week in and week out, the economy continues to track at a similar amount of coverage, garnering between 11% and 16% of the newshole for seven of the last nine weeks. Last week saw major events break on the economy virtually every day. On Tuesday, the President gave a major speech on his plans for job creation. The next day Bank of America announced it was paying back $45 million in TARP funds it borrowed from the government. On Friday retail sales figures were released, up 1.3%, doubling expectations. The same day, the House passed a bill rewriting the rules regulating financial markets and Wall Street. Much of the coverage conveyed a pervading sense that the Obama Administration is surrounded by problems both political and otherwise. “It is politically vital for Obama to show Americans he is not getting distracted by other pressing issues like the war in Afghanistan and his effort to overhaul the healthcare system,” argued a Reuters story on December 8 that read more like an editorial or opinion column in an American newspaper might than a news story. Some of the news was decidedly good. “The Treasury expects to recover all but $42 billion of the $72 billion it has lent to ailing companies since the financial crisis began last year, with the portion lent to banks actually showing a slight profit,” the Times reported Monday Dec. 7. Yet some coverage suggested Obama could be in trouble both for being too hard on Wall Street or too easy. Introducing a story on the proposed legislation regulating the financial industry, CBS anchor Katie Couric began, “A storm of protests may be coming on Wall Street. The government is going after some high-paid executives again…Folks angry at Wall Street have apparently found a kindred spirit,” she said, referring to Ken Feinberg, the man tasked by Obama to monitor executive pay. The news on health care was only slightly less intense. Early in the week the debate focused on new plans emerging in Congress, including expanding Medicare and Medicaid and whether abortions would be covered. What those plans were exactly was murky at first. “Senate Democrats are now considering Medicare expansion as one of several public option alternatives,” MSNBC’s Keith Olbermann said Dec. 7. By Wednesday, it looked as though a compromise had been reached. “Today Senate Democrats were sounding optimistic they’ve got a deal,” reporter Jonathan Karl announced on ABC’s World News Tonight. Yet even as it was described the deal was being criticized, an equation that in the art of communications is a win that day for the critics. At 10% of the newshole, the subject of global warming quadrupled the amount of attention it had received any week since PEJ began tracking the media in January 2007. A week earlier had been the previous high water mark, at 2.3%. Three factors converged to drive the coverage. The first was the run-up to the international summit in Copenhagen to discuss climate change and work out global agreements. The second was the continuation of a story that some have dubbed “Climate-gate.” The third was the formal announcement Dec. 7 by the Environmental Protection Agency, delivered on the eve of Copenhagen, that greenhouse gases pose a public health threat. If anything, the scientific debate over climate change, fueled anew by Climate-gate, was a major factor in much of the coverage, even some of the reporting from Copenhagen. On Dec. 9, former vice presidential candidate Sarah Palin, who would receive more prominent coverage than any other single Republican last week, penned a column for the Washington Post. “The revelation of the appalling actions by so many climate change experts allows the American public to finally understand the concerns so many of us have articulated on this issue,” Palin’s column argued. CNN on Dec. 7 aired a special edition on Campbell Brown’s program, “Global Warming: Trick or Truth?” that reviewed the arguments of both “scientists and skeptics” about global warming, but it didn’t come to any conclusions. “Again, not taking any stances on this Campbell,” reporter Tom Foreman said. The next evening on ABC’s World News Tonight explored the Climate-gate story as well. Reporter David Wright reported that “Just as the world seems finally poised to do something about global warming, an inconvenient scandal…Skeptics of climate change suddenly have plenty of new fodder, 1,000 emails dating back more than a dozen years stolen from a top climate research center in Britain.” As Wright put it, “The emails threaten to undermine the political effort underway in Copenhagen." 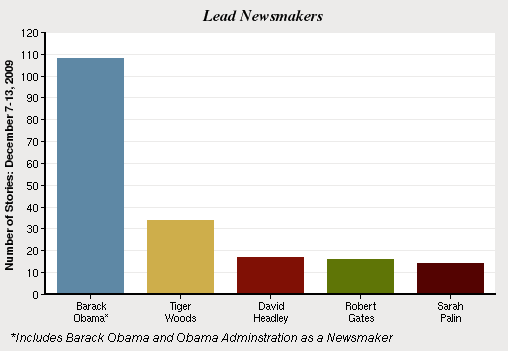 As usual, President Obama was the lead newsmaker last week. Just under 8% of the roughly 1,300 stories were primarily focused on the president. (A lead newsmaker is identified if half of the story is about that person). Though he fell out of the news somewhat, Tiger Woods was a likely reluctant second biggest newsmaker, identified in 2.5% of stories. David Headley, a Chicago businessman linked to the Mumbai terrorist attacks was third, Defense Secretary Robert Gates was fourth and Sarah Palin was fifth, all at less than 2%.